There are times when it becomes necessary to send a problem file to CFFM. These troublesome files are then analyzed by FINPACK Tech Support, so the issue can be resolved. 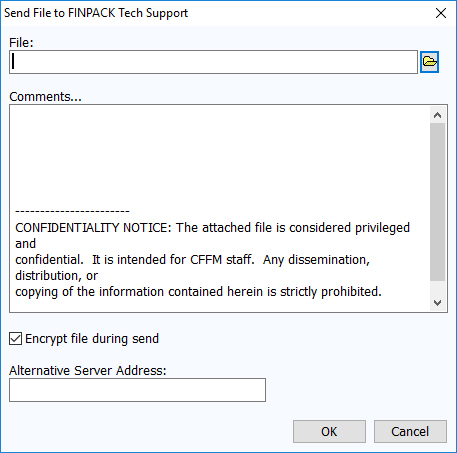 FINPACK has the capability for you to send files securely to CFFM (and only CFFM). While in FINPACK, click Tools, then Send File. This can be accomplished when are either in or out of the file you would like to send. A window will appear that allows you to select the FINPACK file you want to send. The screenshot below appears when you deploy Tools -> Send File. To send the correct file, click on the Folder icon. This is located at the far right of the ‘File:’ data entry box. Clicking on this icon will take you to your FINPACK data folder, where you will be able to highlight and capture the file in question. Once the desired file is captured, the folder and file name will appear in the ‘File:’ data entry box. Next, enter any comments you may have regarding the issue in the Comments section. In clude your contact information in this section as well. Note: if you are sending the file ‘blind’, that is, no one has been informed that you are sending it, it is advisable you include comments. The ‘Encrypt file during send’ checkbox is default-checked. Leave this checked for security purposes. No information will be entered in the ‘Alternate Serve Address:’ box. When you are ready to send the file, click ‘OK’. While the file is in CFFM’s hands, be assured the file remains secure. 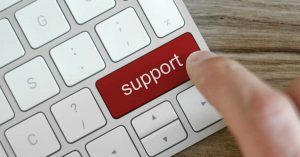 When the problem is resolved, FINPACK Tech Support deletes the file from the CFFM server. As always, feel free to contact FINPACK Tech Support at 1-800-234-1111 x11 if you have questions on this procedure.